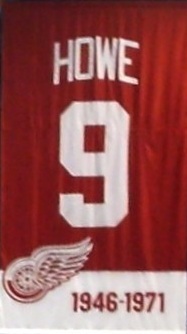 This week’s quotes of the week are by and about the incomparable Mr. Hockey himself, Gordie Howe. I’m really just a lucky old farm boy. Most of the time when I hit the blue line, I have no idea what I’m gonna do to beat the goaltender. Howe has both the ability and the knack for making the difficult plays look routine. [Maurice] Richard—you can’t miss his skill, it’s so dramatic. Gordie—you have to know your hockey or you won’t appreciate him. If you find you can push someone around, then you push him around. When I came up I cut out all the newspaper pictures showing me in a Red Wing uniform just to prove to everyone that I played in the NHL. The weak teams are Boston and New York. 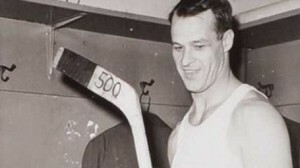 The strong ones are Toronto, Chicago, Montreal, and Gordie Howe. He was the one guy without a weakness: he was ambidextrous, he was big, he was tough, he was a wonderful skater, he had maximum anticipation. In his whole career he never wasted a step. He could do everything on the ice. He was the all-around ultimate hockey player of his time. If you play a little rough, you get respect. And with respect you get just a little bit more space on the ice. He was a lethal combination of grit, power, and single-mindedness. The John Wayne of hockey. The Stanley Cup is not something you can keep forever, you have to earn it every year you play. 1. Wind, Herbert Warren. “Gordon Howe & Company.” Sports Illustrated, 24 Jan 1955. 2. Mulvoy, Mark. “It’s Bobby Orr & The Animals.” Sports Illustrated, 3 Feb 1969. 3. Waldmeir, Pete; Ronberg, Gary. “Stadiums Aren’t For Sleeping.” Sports Illustrated, 20 Oct 1969. 4. Bonander, Ross. Hockey Talk. Delabarre Publishing. 2011.